At Coral Medical Health Spa located in Windsor, Ontario we offer Intense Pulsed Light (IPL) skin treatments using the photorejuvenation process representing a breakthrough in age-defying skin care. This new technique treats skin damage non-invasively — there is no disruption of the skin’s epidermal surface. IPL treatments address the effects of aging and sun damage with low risk of complications and no recovery time. IPL is the gold standard for photorejuvenation. This FDA-cleared, patented technology provides dramatic results for a variety of benign conditions, including age spots, sun-induced freckles, symptoms of rosacea, birthmarks, small veins, acne scarring and other blemishes. What type of conditions does photorejuvenation treat? Pigmented lesions (sunspots or age spots) occur in response to sun-induced skin injuries, and appear as dark brown circles, known as Solar Lentigines. There can also be diffuse browning of the skin, known as Actinic Bronzing. Vascular Lesions: superficial blue, red, or purple veins under the skin’s surface. Some common types include Rosacea (facial inflammation) and Spider Veins (tiny vessels that appear near the surface of the face). What are the photorejuvenation sessions like? Quick and easy! After your initial preparation, the operator will move the hand piece over your skin. The handpiece emits a light that breaks up the pigment in the lesions. Most people perceive a gentle “snapping” sensation, which causes little to no discomfort. Pigment lesions will darken slightly after treatment, and then fade away after about 10-14 days. Vessels (visible veins) generally undergo immediate greying or blanching and the surrounding area may become red. The vessels then fade after about 10-14 days. Most people experience some mild temporary redness and swelling, similar to a sunburn, in the treated area shortly after treatment. This does not interfere with normal activity, and usually subsides within a day. In some cases, the redness may last longer, but will still be mild and temporary. The operator will answer any specific questions you may have about the side effects. Pricing starts at $50. Please call for your complementary consultation. All photos care of Palomar Medical, www.palomarmedical.com. 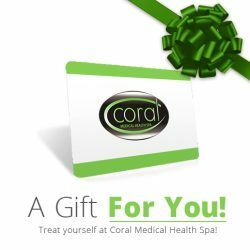 Please contact Coral management for more details.